As beautiful and therapeutic it is to see pigeons sitting on distant trees and cooing, it is just the opposite having them around and close to your house. The cooing sounds can get loud and disturbing. They mess the area with feathers and bird droppings. What’s worse, they can get into your homes and build nests and make a mess around. What a nuisance they become! In addition to adding to the annoyance, pigeons also carry mites, parasites, and diseases and spread them around. Today, there are an estimated 400 million pigeons all over the world, and the numbers are growing at a rapid pace. Pigeons have been known to dwell among man for centuries. They are instinctively comfortable among people, unlike other birds. Pigeons roost in flocks. It is manually impossible to get rid of them overnight. Pigeons are birds of instinct and memory. It will take a while for them to form a habit and roost elsewhere. Patience and resilience are required. Dissuading them strategically is the only way out. What are some of the reasons pigeons are attracted to your homes? Landscape- pigeons are attracted to vegetables and plants in the garden around your house. They usually like berry-bearing plants. Shrubs like Rowan and Cotoneaster provide food even during winter for the birds. 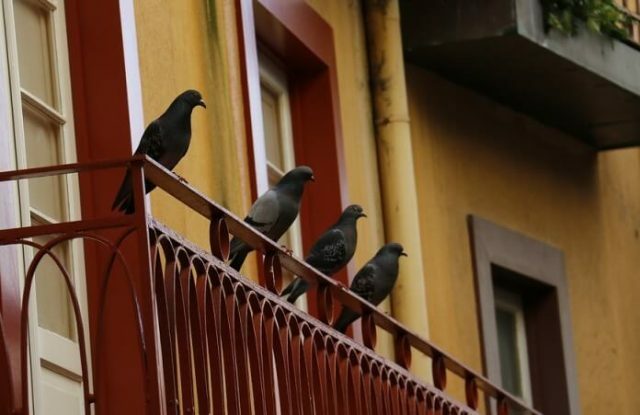 Balconies- Pigeons are natural cliff dwellers. They are attracted to high perches. In the urban areas, they naturally choose the roof or cozy nooks at a height. Your balcony provides a hospitable environment with shelter for pigeons to make their nests and take care of their young ones. Food – Yet another reason to keep your surroundings clean. Dry food items like bread crumbs and seeds thrown around in the area will attract pigeons. Pigeon are year-round breeders. They build their nest in pairs. The male pigeon finds twigs and stems and hands it over to the female one at a time. The female carefully puts it together to make a flimsy pot-like platform. Once the eggs are laid they take turns to incubate them. The male incubates the eggs from morning to late afternoon. The female takes-over from late afternoon to the following morning. They feed their chicks on a regurgitated milky residue produced in their beaks by ingesting bird crops or seeds. The pigeons return and reuse the same nest several times. Unlike other birds, they do not carry away the feces of their young ones which is why they carry so many infections and diseases. Why should you not have pigeons around your house? Spreading mites to the pets of the house. It is easy to identify infected or sick bids. Their feathers look dull and ruffled. They have poor appetites and often leave watery droppings around. Pigeon droppings deface the appearance of homes. 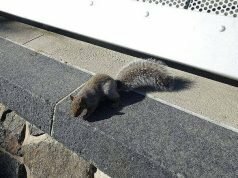 Pigeon droppings attract rats and mice. They are highly acidic. Leaving them on metallic surfaces like your car can damage the paint permanently. It is difficult to get rid of pigeon dropping stains from outdoor furniture and fabrics. They damage gardens and vegetation. Pigeon nests can damage the roof and choke the gutters meant for free-flowing rainwater. How to keep pigeons away? Pigeons have been dependent on humans for food, roosting and nesting. They feed in flocks and empty the bird feeder rapidly. They scare other birds and quickly take ownership of the area. How can you get eliminate pigeons from your vicinity then? Well, there are a number of things you can do around your house to take care of the pigeon problem and make sure they don’t return. Hang up plastic or noisy metal tins to clank and scare away pigeons with the sounds. A clean surrounding is the best way to keep away the pigeons. Have the trash picked up regularly. Keeping the grass trimmed low will keep them out of your yard. It is a convenient and low-cost option. Install spiky rails in your balcony and compound walls. Pigeons will not find a comfortable spot to perch on. They will leave your house alone. Organic spices are a great way to get rid of the pigeon menace naturally. Pepper is a natural deterrent for pigeons because they can’t stand the smell. Sprinkle pepper powder generously in the areas frequented by pigeons. Repeat it twice a day for a month till they find another place to nest. Block all exposed nooks. Cover those them with a sturdy metal mesh to eradicate pigeons. Fill up those gaps. Monitor and meticulously plaster the open gaps and cracks on your walls. Drop a few naphthalene balls in the open gaps and crannies that cannot be filled. Ultrasonic devices can be used without causing much inconvenience to humans. These devices produce sound in small frequencies to repel birds. They are not only helpful in deterring birds but also great for keeping away bugs and insects from your homes. Install flashy wind chimes. If you don’t have wind chimes, make one with old unused CDs. The glare of the light reflecting from the sun on the CDs will scare the pigeons and they will leave your house alone. Once they become weary of the glare they will stop returning to the spot. Pigeons drink about one ounce of water a day. When there is no water, there won’t be pigeons or insects around. Bird baths not only attract birds, they also attract mosquitoes and other rodents in the neighborhood. If it is not possible to get rid of the birdbath, keep it clean and replace it with fresh water frequently. This is one of the most effective and popular natural solutions to get rid of pigeons. Pour it into a spray bottle. Spray the solution on places frequented by the pigeons. Pigeons find the sticky honey solution very bothersome and naturally stop landing on those places. Pigeons love to feed on uncooked grains or dry crumbs. They stay away from sticky substances. Pigeons hate the smell of cooked rice. Make circles using any regular sidewalk chalk near the pigeon holes and areas frequented by the pigeons around the house. Sprinkle some boiled rice in the circles. Repeat once a day for a month. The circles made from sidewalk chalks will prevent ants from carrying away the cooked rice. Pressure wash the pigeon holes with water. Water pressure will scare the pigeons and prevent them from returning. Pets like dogs and love to play chase. 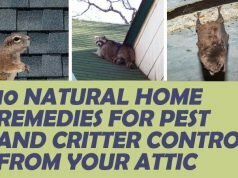 Your pet will have fun scaring off the birds and keep them from returning. Rubber or plastic snakes act as a great deterrent. Tie a rubber snake or plastic snake on your balcony railing or simply place a few of them around the places in your yard they frequent the most. Pigeons are afraid of snakes. They will confuse the fake snake with a real one and keep away from your home. Pigeons are afraid of owls. Scare them by perching a plastic owl in the yard, on a tree or closest to the spot they roost. It will discourage them from coming back. Nesting season is a nuisance. Keep a close watch around your home and carefully remove the nest before the pigeons lay eggs in them. Pigeons are birds of habit. They visit places wherever food is available. They will begin to come regularly if you feed them. Your kindness will lead to a nuisance that you will regret. Pigeons are also known as bully birds. They will pilfer your bird-feeder and scare away small harmless birds. This is one way to trap the birds. It is inhuman to trap and kill birds. However, if the trapped birds are released, they will return to your home, since they are instinctive creatures of habit. They can fly hundreds of miles and return to roost at the same spot. It is best to trap the birds and hand them over to the forest department to take care of the problem. This is another effective and popularly used pigeon repellent home remedy. Pigeons can’t stand the smell of spices. Squirt liberally in nooks, corners, and places frequented by the pigeon. Pigeons are innately habit-forming creatures. It will take them a month or so to unlearn. Strong fragrances are natural pigeon deterrents as they are unable to withstand the smell. Use incense sticks or perfumed candles daily till they stop returning permanently. Pigeons nest round the year. They can lay and hatch dozens of eggs in a year. If space is big enough and conducive, they can produce more. Pigeon killing is inhuman and is illegal in many countries. If the menace becomes uncontrollable, go for the pigeon birth control method. Limit the size of the flock by feeding them kibble type food which makes the pigeons lay dead eggs. Dead eggs do not hatch hence the flock won’t multiply. What to do and don’t while cleaning the pigeon’s nest? When you are cleaning the nest or handling the bird’s nooks do so carefully. Be sure to wear a micron filter mask and handle with gloves to avoid inhaling any kind of airborne and contact disease in the area. 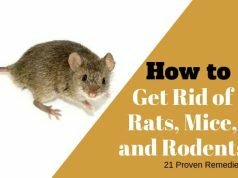 Put it in a safe strong garbage bag and tie it up securely to avoid other rodents rummaging through the bag and spreading it around. Disinfect the area with a bleach solution or bug repellent spray. Seal the area once it is cleaned up to discourage the birds from returning. An effective way of eradicating pigeon menace, especially in areas where the flocks are big in numbers, is to adopt the natural remedies suggested above in combination with the contraceptive method.